The ability to measure voltage, current, and resistance all using the same unit – a multimeter – is still a wonder when you think about it. And owning a properly functioning multimeter – with few smart features like hold and memory – is paramount to the success of any electronic/electrical project. But, it is also important to own a multimeter that is well-suited for your specific tasks. That’s why we have created this list of the best multimeters based on their function, type, and usage. If you are looking for a good quality multimeter to replace your ageing measurement tool, read the detailed multimeter reviews below to get the hang of your favorite model before hitting the “buy” button. This is the ultimate list of the best multimeters available to purchase online. We have categorized our selection based on their type. When working with electronics, even a tiny spike can fry your circuits. Therefore, it is necessary to have a smart multimeter handy that can be one step ahead of your thoughts. In other words, digital multimeters need to be highly precise when dealing with DC voltage. You don’t want to burn the microcontroller which you sourced all the way from Japan for your little hobby idea. So, here are the best multimeters for electronics. Look at the features that they come with and pick your selection. These are perfect for everyday use and are intuitive enough to help you find flaws in your PCBs. Have you ever dreamed of a testing device that would measure and log a set of measurements in a process while you go out and buy some breakfast? Fret no more as the Fluke 287 is here to fulfill your dreams. Its data logging feature helps you capture data (cycles, average values, etc.) in its memory and then export them into a computer for further analysis. The price is further justified by the backlit LCD display that shows multiple measurements at once and also plots a graph of all the recent readings. If that was not enough, it is the only meter in this list that has a menu setting to allow you complete control of how it takes and reads measurements. Electronics is a field that requires both accuracy and safety. Fluke has it all packaged in a single unit: the Fluke 287 digital multimeter. A one-time investment that will take care of all your electronic measurement needs without complaining or giving you problems? With a contrasting display and strongly-built pointer leads, this is another legendary Fluke pocket multimeter. One of the smallest in the Fluke meter series, the 115 is a distant cousin of the model reviewed above. You do not have to calibrate this meter, again and again, no matter how many measurements you have taken. It’s just built in a way that minimizes calibration and gives accurate results. It is rugged, easy to handle and operate, and comes in handy for projects that need you to take it on the road. 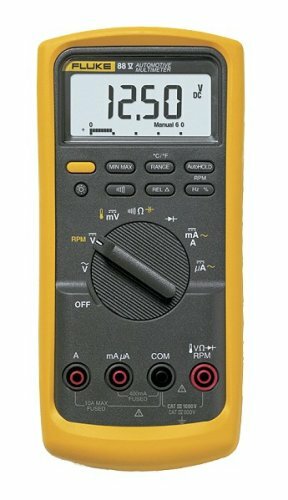 The Fluke 115 multimeter is the perfect choice for anyone who’s looking for a general-purpose meter that will not die even after exposed to hundreds of thousands of repeated measurements. Now that we have an app for everything, why not for electronic testing? This smart multimeter is Bluetooth-enabled, has USB connectivity, and also has apps for Apple and Android devices. If that does not fancy your hobbyist minds, then it also comes with a data logging software so that you can save and export your measurements for analysis. Comes in real handy for large projects. The outer body looks feeble but it is built with quality plastic that will not break even if you drop the meter. And when you compare all this with the price, it won’t be a minute before you hit the Buy button. Because the TekPower is absolutely cost-effective and one of the most inexpensive multimeters on this list. Holding this TekPower meter will make you feel like you are holding an expensive piece of testing equipment with the best features. The TekPower is the best multimeter for electronics hobbyist. The USB feature is what competes with everything. While a general-purpose multimeter can take care of your basic measurement needs, sometimes it’s better to have more features. If you are a car mechanic or are into automotive repair, you very well know how important an automotive multimeter is. In order to find out the best multimeters for automotive use, we analyzed the top features to see how well they address an automotive engineer’s measurement needs. The ability to read rotations per minute (RPM) is one of the most important features. Since it has a direct relation to the electrical input in a vehicle, measuring the RPM becomes crucial. Here are our three best multimeters for cars that will give you full run for your money. Fluke is an American brand that has been around for more than half a century. It is known for precision in the testing equipment manufacturing scene and one that is preferred by us due to reasons you will shortly find out. 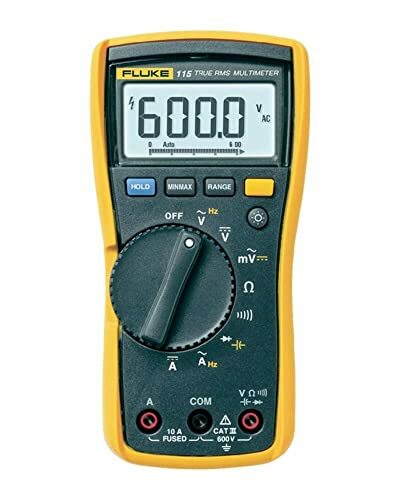 The Fluke 88V multimeter is a heavy-duty tool that boasts of measurements of up to 1000V AC/DC, which is an indication of its strength and capability in high energy environments. It also has an RPM reading function, several troubleshooting features, and temperature measurement that makes it perfect for automotive engineers. But the mark of greatness in this model is not in its ability to measure rotations or voltage but in its built. 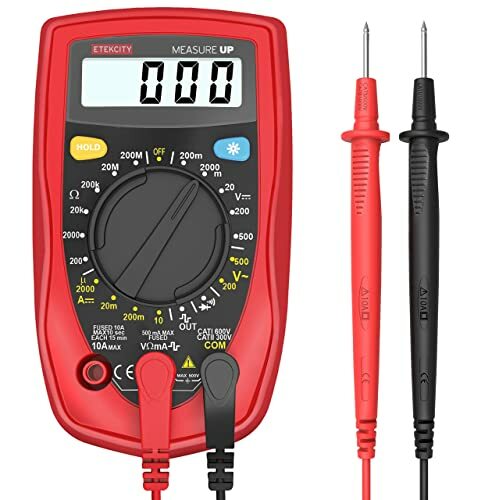 Made with highly rated fiber and stainless-steel leads and test probes, this is the best Fluke multimeter for automotive. If you work with automotive projects, then you have met your soulmate. The Fluke 88V is the best digital measurement tool for you. 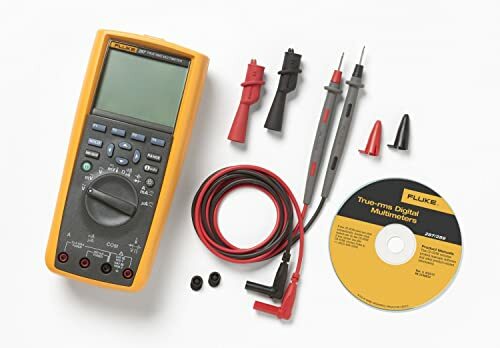 If the Fluke model above was for professionals, this automotive digital multimeter is for the hobbyist who takes pride in their eccentric experiments. Do you always find yourself working on projects you found on Instructables.com? Then you have found your tester. The INNOVA 3340 Automotive Digital Multimeter covers all major aspects of automotive testing viz., alternator diodes, solenoids, wirings, and switches. Its inductive RPM clamp comes very close to the Fluke’s and does a fairly good job. The usual features of auto shut-off (after 10 minutes preceded by a warning sound), overload protection, and auto-ranging is all there in the INNOVA 3340. What we love about the INNOVA 3340 is its large print that makes the readings actually readable even from a distance. Comes in very handy when you are working on an engine. It is also very easy to handle. 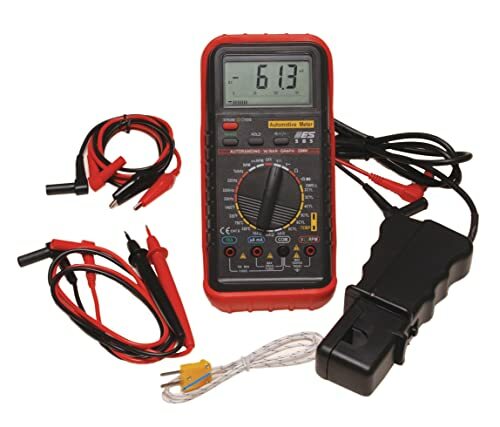 If you are looking for an inexpensive multimeter that has all the bells and whistles of a top-notch automotive meter, look no further. In the same price range as INNOVA, the ESI 585K is perhaps the most economical model to come out of the ESI brand. Anyone who’s ever handled testing equipment knows that ESI is an underdog and considered one of the best, only second to Fluke. It reads RPM for both distributor-less and ignition engines, has 45 test ranges, and is built with 10 mega-ohm input impedance. The latter gives it enough strength to use on all types of automotive engines (even a heavy-duty truck, for instance). However, the feature that we love here is the dual display – a digital meter and an analog graph – that makes this a pretty good automotive multimeter to own. Other than mediocre cables, there is nothing that can go wrong with this model. It’s worth every penny and also comes with a padded case. ESI is a brand that never disappoints and the 585K is one of the best models in the automotive multimeter segment. When working on HVAC projects, it is critical to ensure that you not only get the most accurate measurements but you also are safe while taking the measurements. The multimeter needs to be able to handle high energy and spikes. For these reasons, it makes sense to depend on a multimeter that you can trust and which is used and trusted by professionals. In addition to safety, HVAC multimeters are also capable of reducing ghost voltages with their low impedance function. This is important because HVAC environments can often give rise to phantom readings. The microamp function also comes in handy when you want to sense flame or the level of spark in a project. So, without much ado, here are the top models for you to choose from. 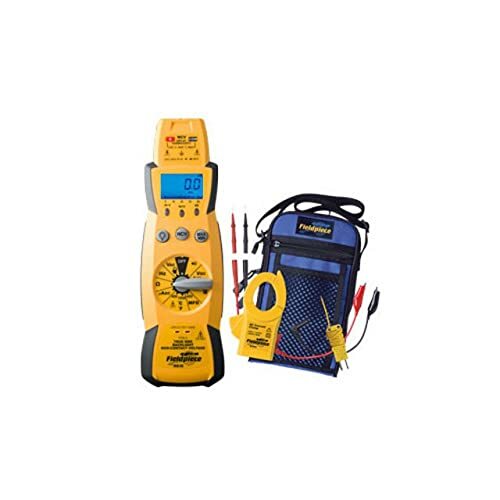 Base your selection on the brand, the usability, or the features and own yourself the best HVAC multimeter today. 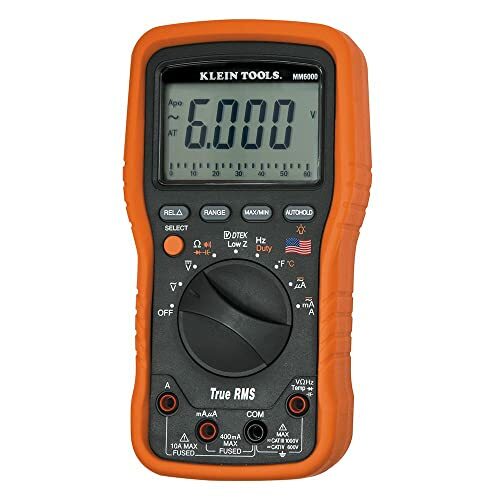 If the price is the only element that is preventing you from getting the Fluke model, go for this Klein Tools multimeter. It has all the features that you will find in an expensive meter and is still crowd-pleasing as it is. The make is strong with rubberized outer cover to provide extra durability should you drop it. What sets this multimeter apart from the other models is that it can measure a lot of things (has a microamp, too, if you’re wondering) and gives solidly accurate results. Testing with this Klein Tools meter is a win-win situation: you do not spend too much and you get all the best features. If you have only heard of a few brands in the testing equipment space, it is time to get a Klein Tools tool. Their meter is cost-effective, reliable, and accurate. 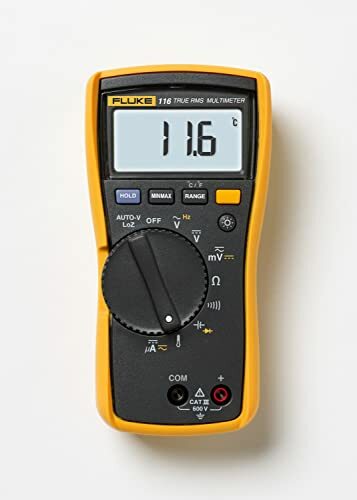 Like mentioned above, the biggest issue while taking measurements in an HVAC environment is the ghost voltage, and the Fluke 116 multimeter is made just to tackle that. It’s a rugged, industry-grade multimeter that measures almost everything that a standard multimeter can and more. And the LED backlight is just the brightest we have seen in a model so far. Tested for safety (CAT III), this meter comes with a heavy load of attachments that will make the HVAC engineer in you dance up in joy. The infrared thermometer is a life saver. 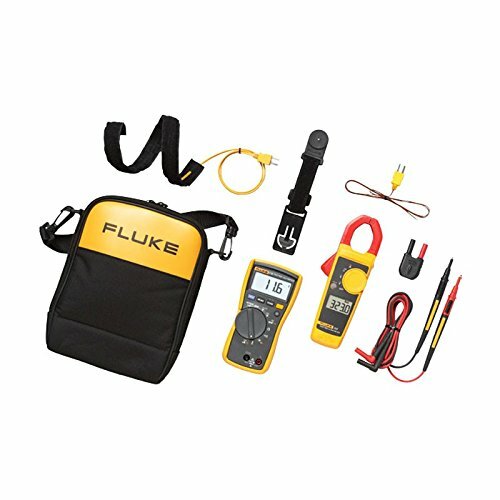 Whether you are an HVAC industry professional or an apprentice who’s just started up, this Fluke meter will take care of all your measurement needs. It’s a one-stop-everything product. Getting a Fluke meter for HVAC is that perfect life decision you make that you won’t regret in a hundred years. This model is known to have changed hands through generations. The decision should be easy. The thing that we absolutely adore and respect about Fieldpiece is that they try to make all their tools compatible with universal testing equipment. So, if you want to use their meter in a process line, just go ahead. Apart from non-contact voltage (NCV) check function, this auto-ranging multimeter is known for being your assistant to a busy electrician. The LED and beeper indicators for when you check DC voltages above 30V is the smartest feature. It should be noted that this feature can get confusing if you do not refer the user manual. There is no low impedance feature, which can catch you off guard with ghost voltages if you don’t pay attention. This is another drawback for when you are working on unsteady circuits. If you are a hobbyist whose applications and their needs can get weirder by the day, this is the meter to go for. It has so many obscure little features (check the manual) that it is the best gift you can give to a technical DIY person. An analog multimeter (AMM) uses needle movement on a scale to display the value of the function being measured. It usually has different scales etched into one to facilitate measuring of different functions in a single unit. They are used to test semiconductors and other electronic components. While analog multimeters have accuracy limitations, they are preferred for applications where the trend of measurement is more important than the actual values. They do not have digital displays, which can make measurement a time-consuming process. However, analog meters have the ability to handle instantaneous changes in the quantity being measured. Without much ado, here are the three best analog multimeters. 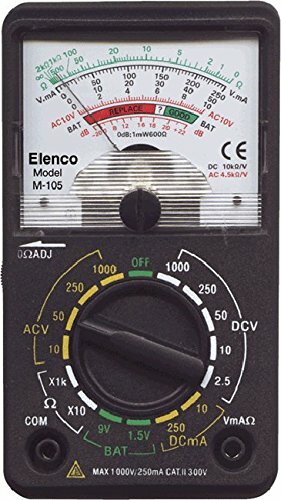 Unlike in digital multimeters (DMM), analog meters do not have to measure the value; the pointer just has to move through the scale and the user comprehends the reading. This is one of the reasons why they are still preferred by professionals. It’s fast and more real-time. Products manufactured by Simpson are preferred by the US Marine Corps, so you get the idea of how rugged they are. One of their popular products is the Simpson 260-8 meter, which is the epitome of precision and ruggedness. It has a very high rating compared to its immediate counterparts, which means you can test heavy loads of AC and get an accurate reading that you can trust. 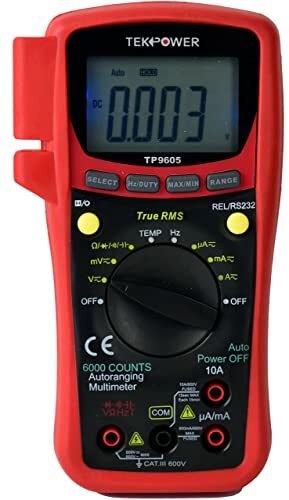 If you are a professional and want a general-purpose meter that has been trusted by professionals for more than half a decade, then this Simpson multimeter is the best bet. It is a great tool to have and gives full value for money. If you fancy the look and feel of a DMM, then this TekPower analog multimeter is going to be your next favorite. Made for the economical, its best feature is the LED backlight which can help you take measurements even in low light environments. It’s very useful, especially if you need to test the electrical equipment in dimly-lit areas like a ship’s meter room. It’s a basic multimeter that will do the job of approximating the function value. The error margin is slightly higher here, but it shouldn’t be a problem if you are a hobbyist who just needs to check the value of current, voltage, or resistance for circuit board experimenting. 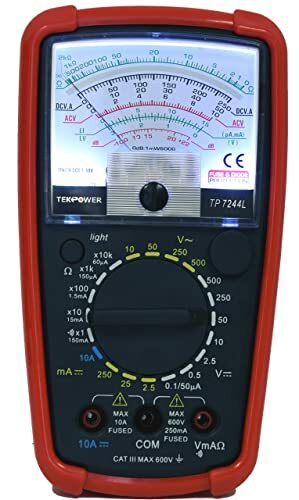 This TekPower model is the perfect analog multimeter for anyone who does not wish to spend much but needs an old-school meter for those experimental DIY projects. This low-cost Volt-Ohm-Milliammeter (VOM) is the perfect addition to your toolkit. It is a well-built meter with solid, robust probes that will not die on you even if you are short on batteries. Most meters are useless without batteries, but not this handy little tool that can measure voltage without needing a set. It can measure both high and low DC-AC volt but has a limited range of 16 amperes. If your needs are general and all you are looking for is a durable meter that will give you pretty accurate results for the vast majority of cases (household, DIY projects, etc.) then this is the best pocket multimeter to get. You won’t regret. So, you are a home-based professional who needs a handy multimeter for DIY projects that may sometimes see you shouting “Eureka!”. And at other times shouting “Help!”. Well, we know how a smart little multimeter can make your day and help you expedite your projects. Or it might just be to check old batteries to see if they work for the clock. Or maybe to impress your partner and actually put that degree in Electronics to good use by checking what’s wrong with the microwave. Whatever be your reason, an inexpensive multimeter that does all these jobs and does them good is what you are looking for. We have selected the three best multimeters under $50 to help you complete your toolkit. Apart from the non-contact voltage (NCV) detection, this Amprobe multimeter is known for its bright LCD display that shows value readings. It can test diodes, measure resistance and capacitance, and also take temperature readings. Amprobe has been around for a while and is popular for its cost-effective testing equipment. It is strongly built and can sustain domestic wear and tear for years. The battery is long-lasting, but if it goes out soon, replacement is easy. Overall, there are a lot of nice features that will make it a perfect match for home users. Lastly, the flashlight on top of the meter will help you take a visit to the garage when you’re working on our magnum opus at 3 in the morning. 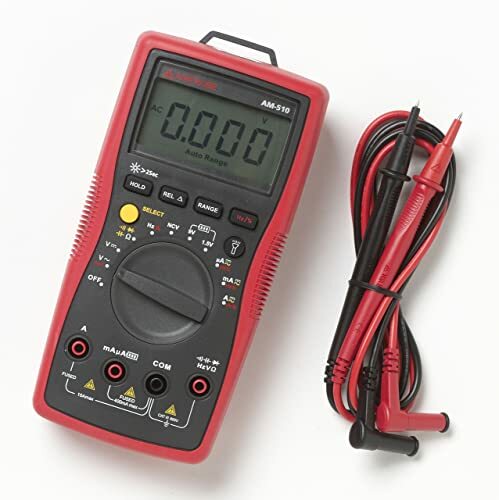 If you are looking for a good cheap multimeter that has all the major features to get by with your home DIY projects, this is the one to go for. One of the bestselling models in the world, this INNOVA 3320 auto-ranging multimeter boasts of color-coded LEDs for a quick battery check and a very large display. If you are weak in the eye and/or often work on long-range desks, this will be the perfect meter. It supports hands-free testing using straps, is easy to operate, and comes with a really helpful user manual. Not that you’ll need a manual to get around it, but INNOVA really likes to keep tiny features hidden inside. So, it’s better to check them out. Overall, if checking batteries and working on rough projects is your thing, this INNOVA multimeter should be your best companion. It’s cheap, it’s sturdy, and mostly, it’s reliable. The INNOVA 3320 is one of the cheapest and most popular digital multimeters around. Millions of users like you depend on it every day. Nothing can wrong with this as long as you do not overload it. Another low-cost, distant cousin of the above two models is this Etekcity meter. It does just about everything that you expect from a basic multimeter and does it quickly. Known for its speed, the Etekcity MSR-R500 model has a sampling speed of 3 seconds so you don’ have to wait long when changing ranges. It has a display backlight but not really bright when you are working in the dark. You will still need an external light to do the testing and read the readings clearly. But that doesn’t prevent it from showing near accurate readings. Owning this tool is a hassle-free experience. It measures almost all valid functions and gives you precise readings for most basic home-based projects. Arguably the best basic multimeter at this price, Etekcity MSR-R500 does the job and does not cost you a lot. Sounds like a great deal. There we go – the top multimeters that you can purchase for good money. Depending on what your applications and projects are, choose the best one that suits you and tell us what you think. If you’re still in a dilemma, let us take you through the best of the best. 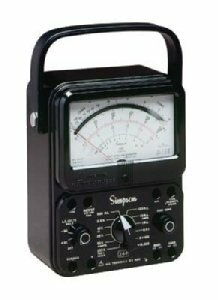 For old timers who need a classic analog multimeter, the Simpson 260-8 is a perfect choice. Automotive applications require a little bit of more strength and safety testing, so go with the Fluke 88V. All projects on HVAC, as the name suggests, should be handled with extra care. For extra care and safety, go with Klein Tools MM6000, hands down the best multimeter we have used in years. For electronics technicians, the Fluke 287 will do the job. Whereas if you are on a budget, try the Amprobe AM-510 – a good bang for your buck. If you are still unsure, just check out the multimeter reviews of each model and make a choice. No matter what you choose, know that each one of these 15 models has been tested and used by our in-house experts. Happy testing!